Topics: Blinds, Curtains, Awnings, Canopies, Commercial, and Perfect Fit Conservatories. It is hosted by Vps-nwsls-lin (England, Leeds,) using Apache/2 web server. 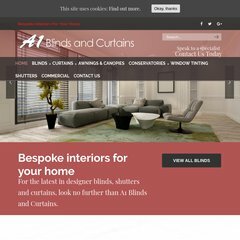 A1blindsandcurtains.co.uk's IP address is 109.104.78.235. There are 3 Nameservers, ns2.phase8.net, ns1.phase8.net, and ns0.phase8.net. PING www. (109.104.78.235) 56(84) bytes of data.